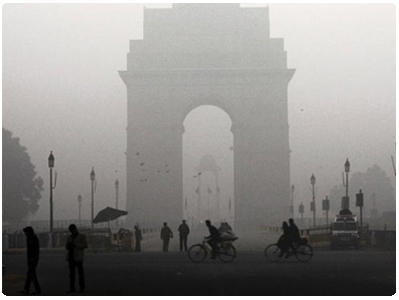 Delhi has a semi-arid climate with high variation between summer and winter temperatures. The summers are long starting in early April and lasting till October with the rainy season in between. Extreme temperatures have ranged from a minimum of -2 to a maximum of 47 C. These are historical records and typically winter nights almost never go below +2C or summer afternoons above 45C. The average annual rainfall is approximately 67cm or 27 inches, most of which falls in the months of July and August during the Monsoon. Traditionally, the Monsoon is supposed to touch Delhi on June 29th every year. Summer in Delhi is no joke - from April the temperature climbs relentlessly to more than 45Â°C (113Â°F) in May and June and the heat doesn't really abate until October. Dust storms called loo sweep in from Rajasthan with considerable fury. The arrival of the monsoon, at the end of June, brings intense humidity - the murder rate usually peaks in this month. From November to March is the best time to visit, with cool but sunny weather. Plus Holi, one of the most exuberant Hindu festivals, takes place around this time. October sees the end of the monsoon, but is reasonably pleasant. Nights can be quite chilly in December and January.